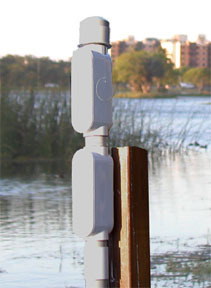 FloodSat® is a self-contained flood water level monitoring device utilizing the unique non-contacting acoustic sound measurement technology of FloodAdvisor®. The resulting measurement data is sent to the Globalstar Low Earth Orbit satellite constellation. The down-linked data is then inserted onto a password protected internet site where it is presented to the user in data chart form. Multiple FloodSat® units can be placed in any area on the same satellite channel as the radio transmission interference is avoided by the very short duration 0.6 second signals. FloodSat® units are easily user programmed with the flooding level, Lat-Long of the location and the user preferred format of data output. FloodSat® units are also user programmed to report at intervels of up to every 15 minutes or down to one per day with the factory supplied software running on any PC using Windows® XP. FloodSat® units also have the unique intelligent software AAR, Automatic Accelerated Reporting, which accelerates the reporting intervals when flash floods or sudden drops in water level are sensed. 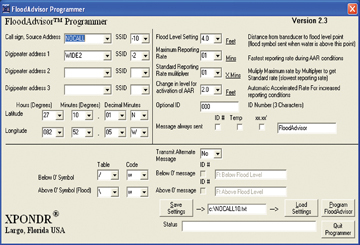 To view a FloodSat® pdf file, click this link.